WPU is proud to announce Janelle Jennings-Alexander, Assistant Professor of English, has won the 2018 National Council of Teachers of English Early Career Educator of Color (EC-EOC) Leadership Award. The award comes as well deserved recognition for an exemplary professor, scholar and researcher. 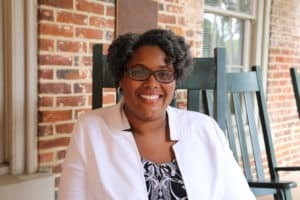 Jennings-Alexander was profoundly honored to discover that she was one of only six educators nationwide to win the prestigious award for 2018. The purpose of the leadership award is to support early career teachers of color as they build accomplished teaching careers in literacy education. The award provides its recipient educators a national forum for professional collaboration and development. The eligibility of the EC-EOC Leadership Award is open to those who are practicing pre-K to university level literacy educators of color who are in the first five years of a paid teaching career. People of color refers to African Americans, American Indians, Asian Americans, Latinos, and Pacific Islanders, all who are historically underrepresented groups. The National Council of Teachers of English (NCTE) is focused on supporting these educators, who they believe will be future leaders in the organization. As a scholar and educator, Jennings-Alexander’s teaching explores the intersections of race, rhetoric and composition in the literature classroom. While Janelle teaches English at WPU, she is also currently finishing her Ph.D. in literature at Florida State University. Her dissertation is titled “Reading Whiteness: Applying a Lens of Critical Whiteness to 21st Century Black Authored Texts.” Her research critically examines whiteness within African American literature and seeks to explore the role an anti-racist pedagogy might play in transforming modern race relations and in recruiting social justice allies. While Jennings-Alexander is honored to win the award, she is not one to rest on her laurels. Having already attended the NCTE summer retreat for the award, she has designed a project that she will be implementing in her classes at WPU this fall. The project will span multiple semesters where students will create stories based on the bits and pieces of local African American history they have researched. Jennings-Alexander and her classes will be working with Friends of Oberlin Village to collect oral history narratives that will be written as children’s books. Students from Raleigh’s Powell Elementary School will then help to illustrate the children’s books, which will then be printed and published for the school and for the interview participants. For more news and feature stories, search #PeopleOfPeace on social media, or visit www.peace.edu/news.